Timex strikes and legacy of ZX Spectrum at centre of major public digital performance. A unique digital art project will catalogue the memories and experiences of the army of Dundee women behind the legendary ZX Spectrum computer built at Timex. Abertay University researcher Mona Bozdog is coordinating major public event, Generation ZX(X), which will feature hours of interviews with 11 female former factory workers, geo-tagged around the city’s Camperdown Park. Beginning at Camperdown House, participants will walk around the park using a mobile phone app to listen to clips at specific locations, marked with colour-coded balloons. The evening promenade on Friday May 4 is part of an ongoing research project that investigates the connections between performance and video games, and is a partnership between Abertay, The Royal Conservatoire of Scotland and The National Theatre of Scotland; funded by Abertay, the Scottish Graduate School of Arts and Humanities and the Scottish Funding Council. It has been timed to coincide with this year’s 25th anniversary of the Timex strikes – an important period in the working heritage of the city. Kicking off at 7.30pm, the walk will take around an hour, culminating in an event at the former Timex factory (now owned by JTC Furniture Group) on nearby Harrison Road, where archive pictures and footage donated by the McManus Museum, DCT Media and STV will be projected onto the side of the building. The projections will include vintage pictures from within the factory, long lost snaps from staff nights out and film footage of a visit to Timex from ZX Spectrum creator, Sir Clive Sinclair, which marked the manufacturing of the one millionth ZX Spectrum computer. A series of bespoke games related to the Timex story have been created by Abertay University staff and a student team, Retrospect Games, and will be available to play on site in custom and classic arcade-style cabinets. 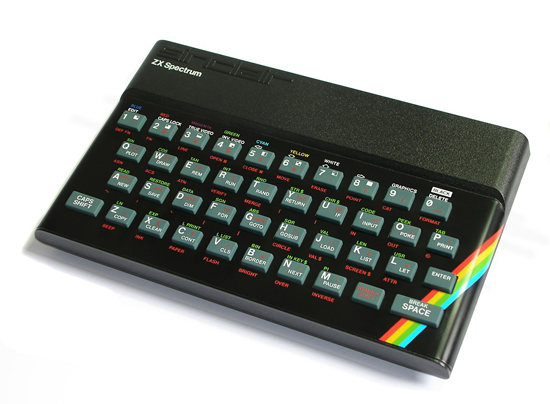 Mona said the production of the ZX Spectrum at Timex played a vitally important role in the birth of Dundee’s currently booming video games industry and, as such, the story should be remembered. She added: “The women of Timex who brought us those computers are the hidden figures of the games industry. “When you walk to the former Timex Camperdown building there is nothing at all that attests that this legendary computer which marked the beginning of UK’s home computers scene was made there. “And it was built by these incredible, hard-working women, most of whom never realised what an impact they have made on Dundee’s video games development and education scene. A spokesperson for Retrospect Games said: “It’s been amazing to be involved in such an important project, cataloguing the heritage of Timex and the ZX Spectrum. “Our team is made up of artists, sound designers and programmers – just as it would be in an independent games studio - and it’s been a really great experience to come together and work on these games. Charlie Malone, a lecturer with Abertay University's Dundee Business School and former Timex shop steward said: “In Dundee, Timex was no ordinary employer, but rather an institution, an institution that connected with all the key stakeholders, from the local authorities, employees, trade unions and most importantly, the communities in which it located its business activities. 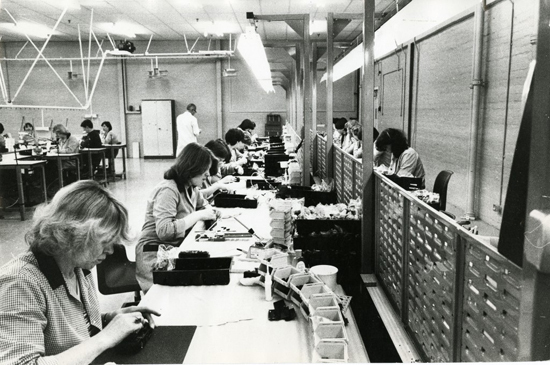 “Timex produced generations of the most skilled engineers in the country, world leading brands, its employees, were some of the most advanced in championing workers’ rights. “Its innovators produced products that would shape the world of computing and spawn the birth of the computer games industry. “If anyone needed reminding of the importance of Timex to the City, it was evident in the dispute of 1993. “What sustained the employees was the ‘social’ rather than just the political solidarity of the citizens of Dundee." 23 December 1946 The U.K. Time Company (a division of the U.S. Time Corporation) opens in temporary premises at Dryburgh Farm House near the factory still being built at Camperdown in Dundee. 1947 The Camperdown factory opens in Harrison Road. 1981 Sinclair Research Limited announces that it has sub-contracted Timex in Dundee to mass produce its new ZX81 computer and printer - plus the tubes for its new flat screen pocket TV. British Shipbuilders announce the closure of the Robb Caledon shipyard in Dundee. 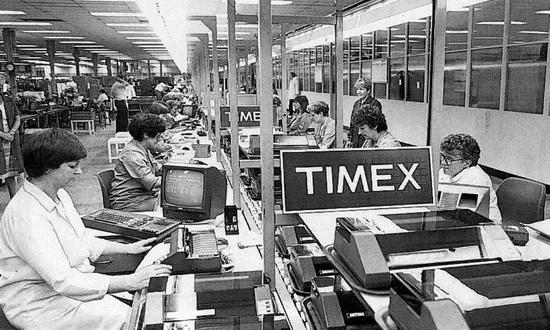 1982 IBM start to sub-contract work to Timex in Dundee. 10 January 1983 Timex management announces 1,900 redundancies - due not only to the loss of the Nimslo contract but also to the cessation of all traditional watchmaking activity in Dundee (which will involve the closure of most of the Milton of Craigie and Dunsinane Avenue factories). 16 February 1983 Sinclair Research says that it has become the first company in the world to sell a million home computers. Timex in Dundee is now producing a computer every four seconds. 9 December 1983 As demand for Sinclair computers in the pre-Christmas rush starts to vastly outstrip production, Clive Sinclair attends a ceremony at Camperdown to mark the production of the one millionth Spectrum micro-computer. 9 August 1985 Robert Maxwell withdraws his rescue bid for Sinclair Research. 1986 Amstrad buy the rights to sell and manufacture Sinclair Research products. 29 January 1993 A mass meeting in the canteen at Camperdown votes in favour of industrial action. The strike starts and is officially sanctioned by the executive council of the AEEU. 1 May 1993 There is a May Day march to Dundee City Square. Sacked workers speak at May Day rallies throughout Scotland. 24 May 1993 By now, 16 of the original 17 non-strikers have re-started work at the factory. However, none of the other 326 sacked workers have crossed the picket line. The regular Monday morning mass demonstration at the factory gates is noisy but incident free. 15 June 1993 A sunny dawn in Dundee. Early in the morning, Timex executives take the decision to close the Camperdown factory by Christmas. Muhammad Saleh announces this to local union officials and that TEC management have offered to negotiate an ex-gratia payment to the sacked workers to come back for the run down on the same terms as the replacement workforce. Shortly after the closure announcement, the skies darken and rain pours down. 17 June 1993 With two exceptions, a meeting of sacked workers rejects the management offer of temporary work. In addition to input from former workers, Mona recorded a series of interviews with today’s games industry legends to accompany the projection displays. At the end of the event - which is part of the NEoN Digital Arts Festival 2018 programme and is supported by Abertay’s Weave cultural outreach programme - there will be choir performances from female Dundee singing groups, organised by Alice Marra. And just a week later, on Friday May 11, Abertay Digital Graduate Show will launch at Abertay Student Centre, offering up the annual five-day feast of digital art, computer games, VR, sound design and much more. The creative team behind Generation ZX (X) includes Mona Bozdog, Dr Dayna Galloway, Clare Brennan, Niall Moody, Robin Griffiths, Kayleigh MacLeod, Robert Clark and Alice Marra.